Rust surveys were carried out in all the four key wheat growing regions of Kenya: South Rift, Mount Kenya region, Central Rift and North Rift. The surveys were conducted by experts from the Kenyan Agricultural Research Institution (KARI). A total of 296 farms were sampled. stem rust was detected in 196(66.2.0%), yellow rust in thirty-one (10.4%) and leaf rust in eight(2.7%) of the farms with disease severity ranging from trace to 80S, 50S and 40S respectively. The rusts were detected in all the wheat growing regions. Stem rust infection ranged from TR to 80S with infection in South Rift (69.6%) North Rift (55.8%), and maximum infection in Central Rift (92.2%) and Mount Kenya region (57.7%). Yellow rust infection ranged TR to 60S with minimum infection in North Rift (7.4%) ,South Rift (8.9%) and maximum infection in Mt. Kenya region (15.5% and Central Rift (11.8%). 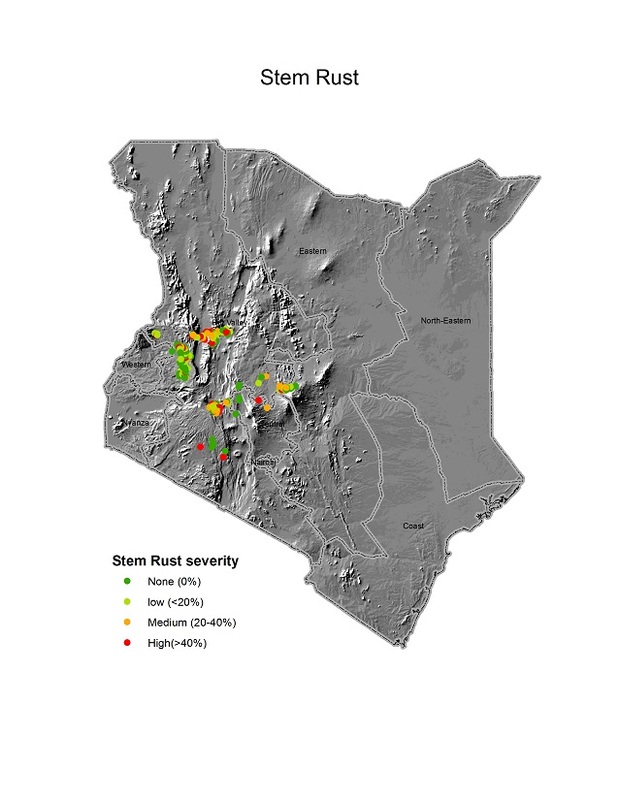 Leaf rust infection ranged from trace to 50S with minimum infection in Mount Kenya region (1.4%, Central Rift (3.9% and maximum infection in North Rift was (5.3%). Commonly grown varieties :Robin, NJRBWII, KSMwamba and Kwale . Robin was popular in Central Rift( 47.1%), Mt.Kenya region(43.7%), South Rift (41.8%) and North Rift (12.6%) of the sampled fields.Variety NJRBWII occupied the largest area in North Rift (63.2%). The area planted with NJRBWII increased in 2014 the North Rift compared to 2013 in the same region and the area under Robin increased in the other three regions. Variety Eagle 10 still occupied a very small area in all the regions except in the South Rift(19.5%) of the sampled fields. The general observation was that the adoption of Robin was coming up very fast, but unfortunately the variety has broken down to apparently new race of stem rust yet to be defined. Only those farmers who sprayed following the right recommendations harvested/will harvest the crop. Those who did not spray or sprayed without following the proper recommendations lost the crop to the disease. Secondly, the disease pressure was very high in all the regions but the majority of the farmers sprayed to keep the inoculum load low( South Rift,North Rift,Central and Mt.Kenya region).